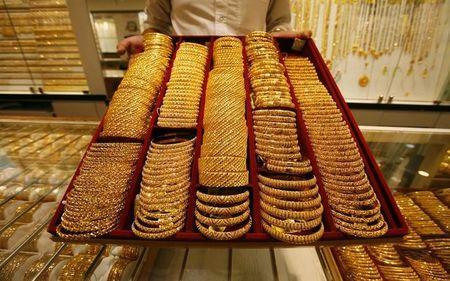 LONDON (Reuters) - Gold prices fell modestly on Tuesday after the new chairman of the U.S. central bank pledged to stick with gradual increases to interest rates. Spot gold was down 0.3 percent at $1,329.01 an ounce at 1430 GMT, paring losses after falling as low as $1,324.51. U.S. gold futures shed 0.1 percent to $1,331.10 per ounce.New Federal Reserve chief Jerome Powell said in prepared remarks to the U.S. Congress that rate hikes should continue despite the added stimulus of tax cuts and government spending. The current Fed consensus has signalled three rate increases this year. “It's maybe a touch more hawkish," said Jason Ware, chief investment officer of Albion Financial in Salt Lake City. "One thing that surprised some was that he seemed to directly mention the stock market and recent volatility as something they’re not concerned about ... we are on pace for gradual rate hikes." The dollar index strengthened slightly after Powell's published remarks were released ahead of his live testimony, due at 1500 GMT. [FRX/] The index has rebounded 1.7 percent since falling to a three-year low of 88.25 on Feb. 16. Some investors had expected Powell to be less hawkish, said Georgette Boele, commodity strategist at ABN AMRO in Amsterdam. "Once they realise that the policy's going to continue like it has, then the dollar should recover and gold move lower. With the positioning that's in place, we'll get profit-taking in long euros and long gold." Boele expects gold to slip under $1,300 an ounce by the end of the quarter. "Initial support for the metal holds around $1,325-$1,330, while resistance cuts in broadly between $1,340-$1,345," MKS PAMP Group trader Sam Laughlin said in a note. Helping to support gold was data on Tuesday showing that net gold imports by China, the world's top consumer of the metal, via main conduit Hong Kong surged 65.2 percent in January from the previous month. Last week, however, data showed gold imports by No. 2 consumer India fell 22 percent in January. will be enough to offset lower investment demand elsewhere as a result of Fed tightening," commodities economist Simona Gambarini at Capital Economics said in a note. "As such, we think that the price of gold will fall back from current levels." SPDR Gold Trust, the world's largest gold-backed exchange-traded fund, said its holdings rose 0.21 percent to 831.03 tonnes on Monday from 829.26 tonnes on Friday. Among other precious metals, silver gave up 0.4 percent to $16.59 an ounce. Palladium lost 0.2 percent to $1,059.10 per ounce while platinum fell 0.7 percent to $992.60 per ounce.